The number of U.S. Hispanics eligible to vote (U.S. citizens ages 18 years and older) is estimated to reach a record 27.3 million, up by nearly 4 million since 2012 alone. Yet, the Pew Research Center survey reveals that the share of Hispanic registered voters who say they are “absolutely certain” they will cast a ballot this year is smaller than the share of those who said this in 2012. The new poll also shows that planning to vote among Hispanic registered voters once again trails that of the overall registered voter population. About seven-in-ten (69%) of Latino registered voters say they are “absolutely certain” they will vote in this year’s election, according to the new survey. However, this is down compared with 2012, when 77% of Latino registered voters planned to vote. Latino registered voters are also less likely than all registered voters to say they will vote in this year’s election. While about two-thirds of Latino registered voters say they are “absolutely certain” they will vote in this year’s presidential election, 86% of all registered voters say the same. Among Hispanic registered voters, there are some notable differences in planning to vote this year. For example, non-Millennials (ages 36 or older) are more likely to say they are certain to vote (74%) than younger adults (62%). There is also a difference among Hispanic registered voters by language. Those who speak English either as their primary language or who are bilingual are also more likely to say they are certain to vote (69% and 73% respectively) than those whose primary language is Spanish (58%). Hispanic registered voters with higher levels of education are more likely to say they are certain that they will vote as well – 58% of those with less than a high school education, 60% of those with a high school diploma and 75% of those with some college education or more say this. Compared with 2012, the share of each major demographic subgroup of Latino registered voters that say they are absolutely certain they will vote is down. This decline was marked among English-dominant Latinos (12 percentage points), Millennials2 (13 points) and those with some college education or more (10 points). The new survey asked this group of Hispanic eligible voters, too, if they plan to cast a ballot in November. With the election date fast approaching, just 30% of unregistered Hispanics say they are absolutely certain they will vote this year. Among Latino registered voters who are “absolutely certain” they will vote in the coming election, 20% will be voting for the first time. As would be expected, Millennial Latinos are more likely to say they will be first-time voters (36%) than non-Millennial Latino voters (9%). Some 3.2 million young Latinos entered adulthood between 2012 and 2016, accounting for three-quarters of the growth in the Latino electorate. 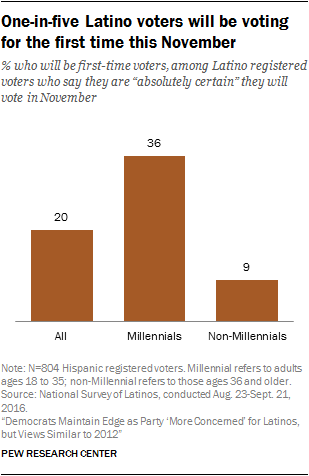 Additionally, there are other Latino demographic subgroups that have large shares of first-time voters. About a quarter (26%) of Latino voters who speak Spanish as their primary language are first-time voters this year. By comparison, 16% of English-dominant Latino registered voters are voting for the first time in 2016. And Latino registered voters with a high school degree are more likely than those who have some college education or more to say this year will be their first time voting (31% vs. 16%). When it comes to interest in this year’s presidential election, the new survey finds that 67% of Latino registered voters say they have thought “quite a lot” about it. This is below the level among all registered voters (80% “quite a lot”), and similar to the level of interest among Hispanic registered voters in the last presidential election (61%). Among Hispanic registered voters, seven-in-ten (70%) Hispanic registered voters who are U.S. born say they have thought “quite a lot” about the election, compared with six-in-ten (60%) of those who are foreign born. Hispanic registered voters of Mexican origin are less likely than other Hispanics to have given a lot of thought to the election (62% vs. 76%). Interest in the election varies greatly with levels of education: 77% of Hispanic registered voters with some college education or more have given a lot of thought to the election, compared with 57% of those with a high school diploma and 50% of those with less than a high school degree. In the last few years, many states either have passed or considered passing laws that would require potential voters to show official photo identification before casting a ballot on Election Day. Currently, according to the National Conference of State Legislatures, 16 states – Alabama, Florida, Georgia, Hawaii, Idaho, Indiana, Kansas, Louisiana, Michigan, Mississippi, Rhode Island, South Dakota, Tennessee, Texas, Virginia and Wisconsin—have such laws in effect for 2016. These developments could have an impact on Latino voter turnout. Together, these states hold 37% of all Latino eligible voters. According to the new Pew Research Center survey, fully 97% of Hispanic registered voters say they are confident they have the identification they need to cast a ballot; among Hispanic eligible voters who are not currently registered to vote 85% say the same. Across the 16 states that require photo identification, 98% of Hispanic registered voters say they possess the required documentation to vote. Latino voters have long had one of the lowest turnout rates of any group in past presidential elections, with 52% of those eligible to vote not casting a vote in 2012, for example. Among Latino eligible voters who say they will not vote, dislike of the candidates is the main reason given by 33% of them, while 22% say they are not interested in the election or feel their vote will not make a difference.